Monday we left Denali National Park, traveling south about 156 miles to an area just outside of Talkeetna. This town is known for having an amazing view of Mt. McKinley, right along the highway, weather permitting, of course. There is an RV Park in town, but it was small and jammed with a caravan, so we decided to stay down the road at the Mat-Su Valley RV Park. It had plenty of space, long and wide spaces, away from the highway and the train. After Denali and Fairbanks, it was nice to have big open spaces. Also, it wasn’t one of those “parking lot” campgrounds, this had trees around the perimeter and in between the spaces. As nice as the park was, it never got full. Perhaps it was because you had to drive back to town on the highway 23 miles, but that was OK with us. We were last here in 2002, and stayed at the Talkeetna Lodge, which is every bit as grand as any of the Princess Lodges. It is set off the highway on a hill overlooking the town, the river and best of all, The Mountain. On that trip we were doing a Heritage Tour, where “you-drive” and they set up all of your lodgings. Our second night after Anchorage was at the Lodge. After a long drive it was wonderful to see. However, the best part was when we walked into our room; the Mountain was out and perfectly framed in the window!! Awesome! We were so excited we just ordered “Room Service” for some wine and cheese, turned the couch around to enjoy the view! Later when we went to dinner, little did we know that the entire dining room had the same view! :-) We had other places to see the next day so we didn’t get to see much of the town. 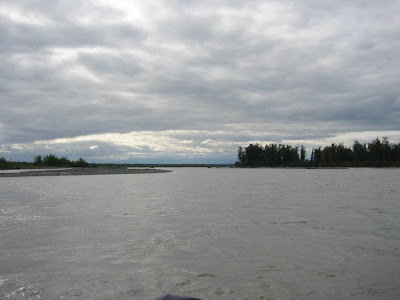 This visit was our chance to see the “quaint” village of Talkeetna. Thanks to our Tour Saver Coupon Book we had coupons for both rafting and flight seeing! The only catch was they had to be used at a certain time, but that worked with our schedule. 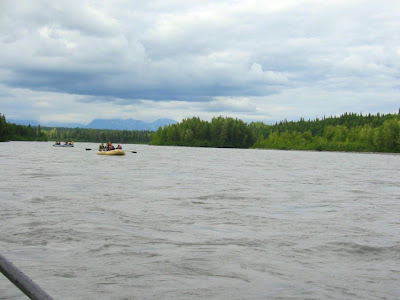 So Tuesday we did the raft trip, rafting down the Chiltna and Susitna Rivers. Wednesday we did the flight seeing over Mt. McKinley! The river had such a good current; we thought the guide wouldn’t have too much oaring to do, except for steering the raft. Not so, there were so many obstacles to avoid, running up on the gravel bars, fallen trees and all of the channels involved with the river!! She was barely 125 pounds and not buffed up at all, but she was a native of Talkeetna, so she was definitely quite experienced in negotiating the obstacle course! A half hour into the ride, one of the members of the family from Florida, who were sitting in the bow of the boat, became sea sick, or should I say “river sick”!! This was a calm river, no white water or bouncing! Plus we had 3 more hours until we returned to Talkeetna!! The rest of us enjoyed the trip, seeing several Bald Eagles, including one parent bird sitting at her nest high up in the trees. A beaver went swimming by not more than 20 feet from the raft! We saw lots of his handiwork on the trees along the edge, and those were pretty good size trees that he and his family had gnawed on! We saw a pair of Ravens playing in mid-air, probably siblings practicing their aerial fighting. The sun came out for a while, that warmed up the scene nicely. Though, between the rubber boots, the rubber rain coat and the Personal Floatation Device, we weren’t too cold. 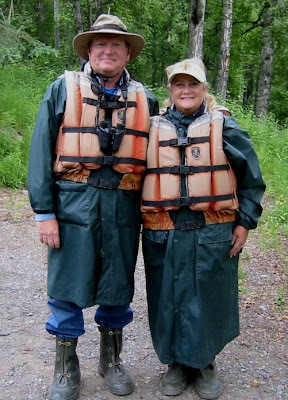 The fellow with the river sickness wasn’t doing too well, in fact, his wife asked in the last hour, “How much longer until we’re back?” (I don’t know what she wanted the guide to do, whip out an outboard motor to get us back faster!) So our guide really put a lot more muscle into paddling, in fact, she had to stand up to get us going even faster! We are pretty sure she’d never done the last bit of the ride that fast before! 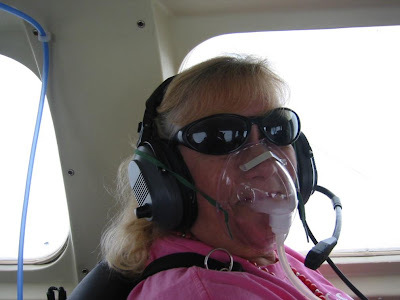 She radioed to shore that she had a sick passenger, so they could meet them at the beach. He could barely get out of the boat, even with his father-in-law helping. He collapsed on the beach! Well, the rafting company had people there to help, so we gladly walked the 2 blocks back into town, it was so good to stand and walk! All in all, it was a great raft trip! The next day was an even more exciting event! We had booked a trip on a flight around Mt. McKinley. It was an awesome flight seeing trip!! On our first trip to Alaska in 1998, we had reserved a flight, but a big storm grounded all aircraft when it came our turn to fly. That was OK with me, because it turned into a snow storm that even closed some of the park’s roads! 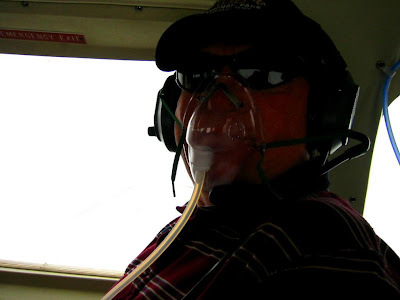 I didn't want to have anything to do with flying in those conditions in a little plane. 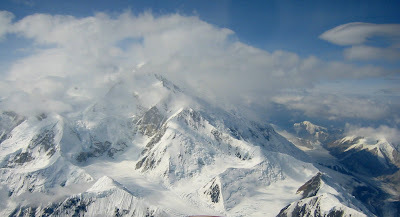 It was all gray and overcast down in Talkeetna, but when the pilot climbed to 13,000 feet, we were finally above the clouds! It gives me the willies flying through clouds that much, naturally, he was flying on instrumentation and giving us the “tour guide narration” of the area. There wasn't a single plane out there with us, which was a good thing. Especially when you see so many planes zooming around Talkeetna flight-seeing! The trip was great! He took us all of the way up towards the top, he said we were within 2 miles of the mountain, but it looked a lot closer! Naturally the mountain was making its own climate, but he circled it a couple of times to make sure we could see the top. Boy, it's so big up close and personal, it took a while to just fly around it! 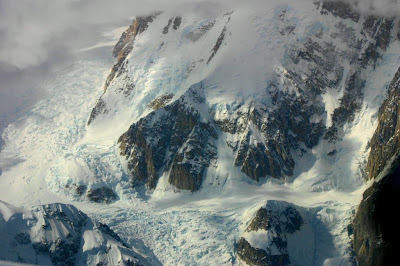 There are so many glaciers on the slopes and the surrounding mountains right next to it, I lost track of their names. All of them are different. 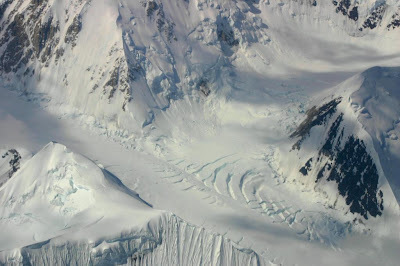 Some are so steep and craggy with blue ice, some are smooth, and some are topped with black volcanic rocks that are sliding down with the glacier. At one point we could see Kantishna and Wonder Lake, which is where we stayed in 2002. From there we had an exquisite view of the mountain from the ground. Grant and I were both clicking away on our cameras. Mine had the zoom and he had the small Canon with a wide angle lens. It's amazing the pictures came out considering we were shooting through the plane's windows, plus the plane is angling back and forth so each side of the plane got a good view! The pilot was great, very friendly; making sure everyone had a great view of the mountains. He told us about a team that skied down the one side of the mountain and lived to tell about it!! INSANE!!! The blue glacial ice visible through the snow makes for a really neat contrast! Even the pictures where you can't see the peak are still impressive. Loved your blog today. Kathy, you are a natural writer. 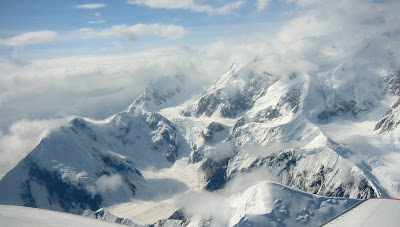 I can't wait to get up to Denali and take the same tours. What an amazing trip! Although I don't always leave a comment, I am enjoying your blog and great pictures! !